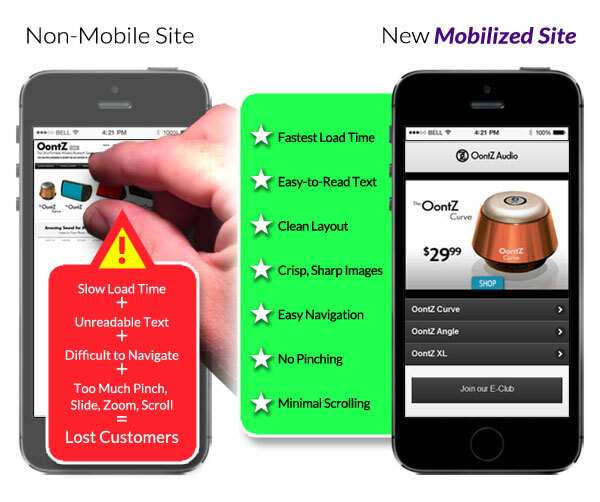 Enlightened's new Mobilizer™ product is not just another "shrunken" or "less than the Desktop" website, it actually targets mobile usage, and is customized to your brand. Serve content that is specifically adapted for the device, the requesting device’s UA (user agent) string is checked and the appropriate content is served using an optimized custom mobile design created to address your specific needs. Based on your specific requirements, Enlite10's production team will integrate revenue generating mobile features, customized to your needs. Initial site design and customization will be handled by Enlite10's development and design team. Then the CMS feature set, which is specially tailored to optimize mobile interaction, will allow you display and convey the information most valuable to your mobile site visitors. 40% of web visitors today are using a mobile device (iPhone, Android, Tablet) to access your website, and many experts believe it will approach 50% by the beginning of next year. So you have no time to waste, the Mobilizer from Enlite10 provides an optimum mobile viewing and browsing experience. Using the same site for both Desktop and Mobile visitors, even relying on a responsive design, compromises one or the other. At Enlite10, we believe the user experience is paramount and that is why a mobile specific site is the best option.